The short-term pattern on the S&P 500 (SPX) remains a mess, but the intermediate picture appears close to clarifying more definitively. 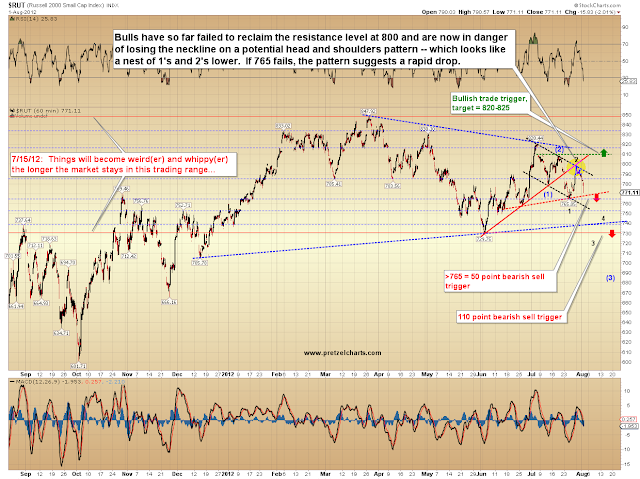 The Russell 2000 (RUT) lost some potentially key short-term price territory yesterday. A trip beneath RUT 765 is now required to "seal the deal" for the bears. If RUT moves below 765, it will be extremely difficult to match the current move to any type of intermediate bullish pattern, and instead will suggest that RUT has been warming up for a more serious decline. The chart below shows that RUT has also formed a potential head and shoulders pattern, which seems to confirm the Elliott Wave fractal. Again, 765 is the key intermediate-term level here, so I don't want to convey that bears are completely in the clear yet; because they aren't. However, Wednesday's deep retrace overlapped some key short-term price territory (774), which was the apparent peak of wave a or (1). 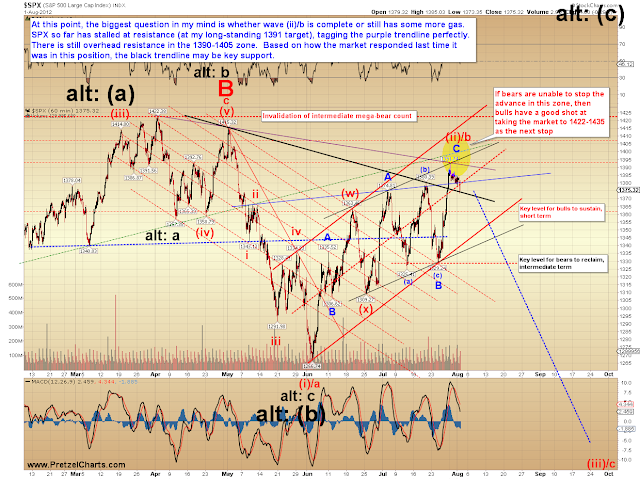 Elliott Wave rules do not allow waves 1 and 4 to cross paths, so this overlap suggests that the recent rally in RUT was an ABC corrective rally, which means the intermediate trend is down. One of the key tenets of Elliott Wave Theory is that price travels in a series of five waves when it's heading in the direction of the larger trend, and it travels in three waves (or some variety thereof) when it's moving against the larger trend. 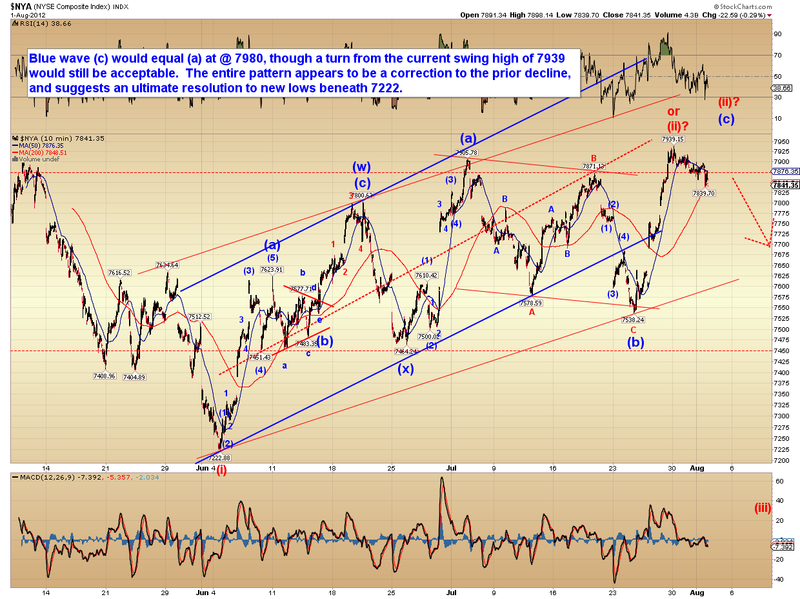 In other words, the overlap at 774 suggests that 765 will eventually be tested and likely broken. The market could head lower fairly directly, but, as always, reserves the right to first stretch out the pattern sideways if it so desires (and by "sideways," I'm referring to the range that's formed between 765 to 808). 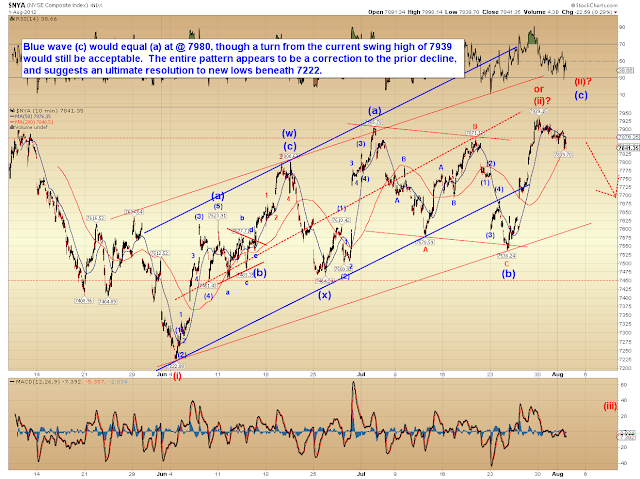 Looking at this chart, we can see that the decline from 820 is still three waves, and thus could still be viewed bullishly. A new low beneath 765 would break that three-wave appearance. 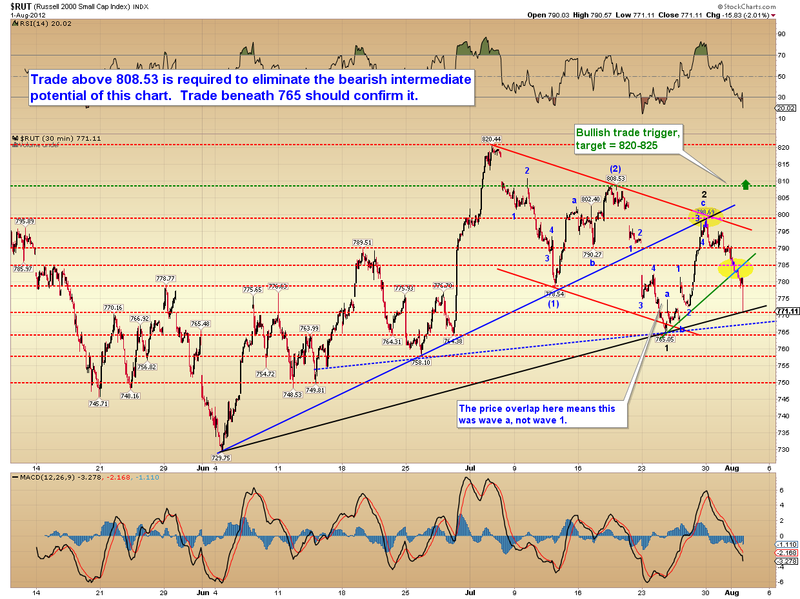 The hourly RUT chart shows the updated pending bullish and bearish trade triggers. The short-term SPX chart remains messy, and is of little use. 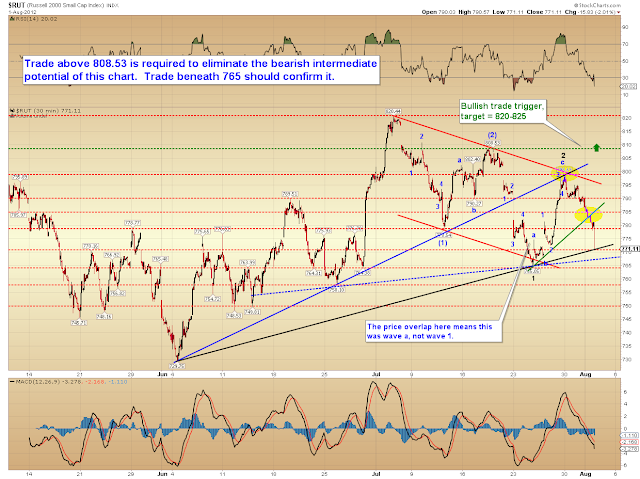 I am completely uncertain if 1391 will mark a meaningful turn, or if the bulls have some more firepower. The pattern currently still looks like a bull flag, which could suggest higher prices over the short-term -- however the setup is very similar to the last time the market broke out and then came to rest on the black trendline (on July 20). The market gapped down the following day. Given the information in the charts at this moment, an eventual bearish resolution to new lows beneath 1266 still appears probable over the intermediate term. 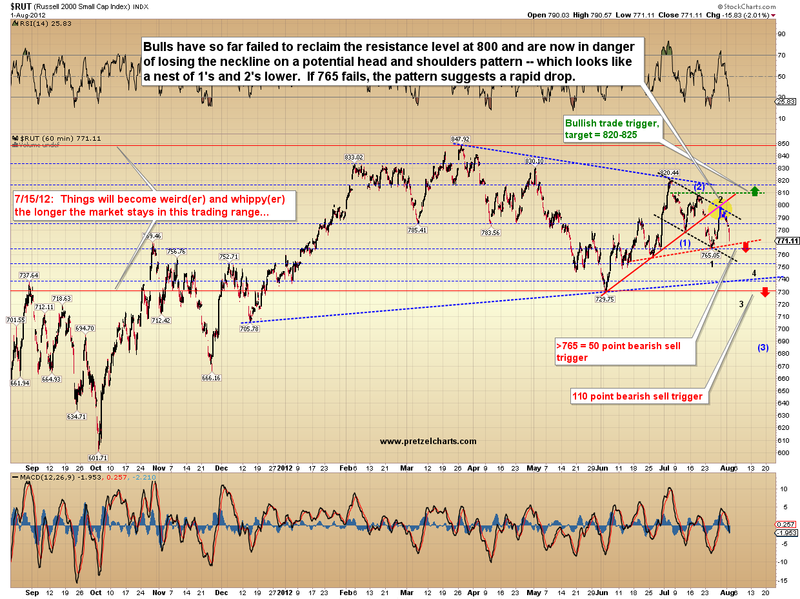 The NYSE Composite Index (NYA) also suggests the rally may be over, or nearly so. In conclusion, new swing highs over the short-term would actually look better for the pattern but are not required. A bit more upside would still leave the larger fractal looking bearish from an intermediate perspective -- it would, in fact, take a meaningful breakout from the bulls to invalidate the current bearish appearance of the intermediate charts. This would probably require a bullish announcement of new liquidity from Europe's central bank. Trade safe.